British chicken cooked with a spicy paste, roasted, and garnished with parsley & chilli. With a sachet of spicy cabbage pickle. 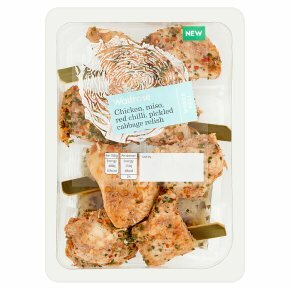 INGREDIENTS: Chicken (83%), rice vinegar, cabbage, sugar, fermented red chilli (3%), fermented broad beans (2%), salt, cornflour, dried parsley, chilli flakes, sunflower oil, maize starch, garlic, mirin, soya beans, preservative (sulphur dioxide), wheat.